(Cow Vetch (Vicia cracca) - 05) The purple colored wildflowers in this God-created living bouquet are two kinds of vetch, cow and hairy. 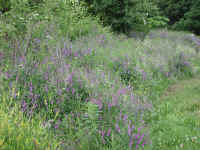 During the last few years, we hardly saw any due to excessive roadside mowing, but this year the vetch had re-established itself further back in the field. (Cow Vetch (Vicia cracca) - 01) Each of the downward growing flowers on this cow vetch raceme is only about 1 centimeter long. 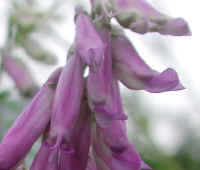 Cow vetch is a member of the Pea family, a legume, because it has nitrogen-fixing bacteria on its roots, which not only fertilize itself, but the other plants around it. (Cow Vetch (Vicia cracca) - 01a) The tiny leaves of this cow vetch look unusual. The leaves seem to grow sideways along the stem. 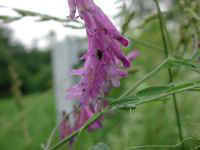 The leaves normally grow upwardly and outwardly from the stem in alternating groups of 8-12 pinnate leaves. (Cow Vetch (Vicia cracca) - 01b) Obviously, we weren't the only ones who were enjoying the cow vetch. This beetle came for lunch. (Cow Vetch (Vicia cracca) - 02) Another interesting aspect of the cow vetch is the way the flowers project their pistils from the maturing but still unopened buds. At a casual glance, it looks like another flower growing from within the cow vetch bud. 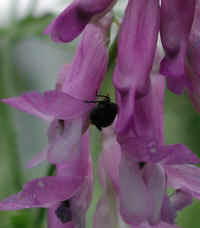 (Cow Vetch (Vicia cracca) - 03) As the cow vetch flowers mature, their deep violet color fades to a pinkish color. Our little beetle friend posed for this picture, too, which has been enlarged about 20 times the actual size when viewed in the full screen version. (Cow Vetch (Vicia cracca) - 04) We can see the stamens in the cow vetch flower on the right. 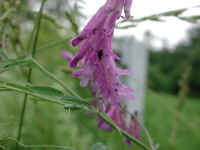 The name cow vetch originated because this wildflower was used as a pasture forage crop.